Internet Service Providers are migrating infrastructure from hardware to software solutions and adopting 6WIND’s vRouters as core routers for their networks. For this use case, ISPs require high performance routers with BGP, OSPF, LAG, VLAN, filtering and high availability features to connect directly to Service Provider networks for upstream and downstream traffic across multiple data centers. Here is an example with Minorisa, a Spanish ISP. Minorisa ran out of capacity with its existing Cisco and MikroTik hardware routers. 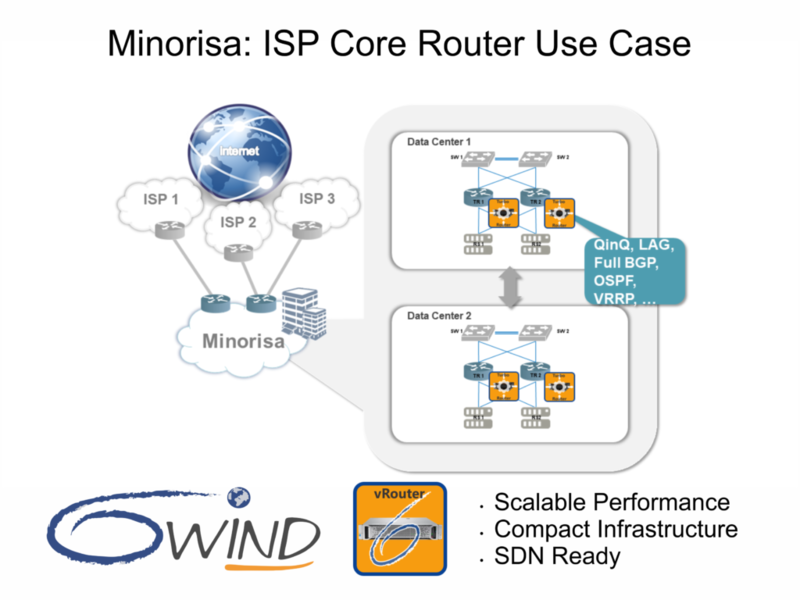 Instead of selecting a higher performance hardware router from Cisco or Juniper, Minorisa selected 6WIND’s vRouter to connect directly to its Service Provider networks for 40G upstream and downstream traffic to support its data centers. 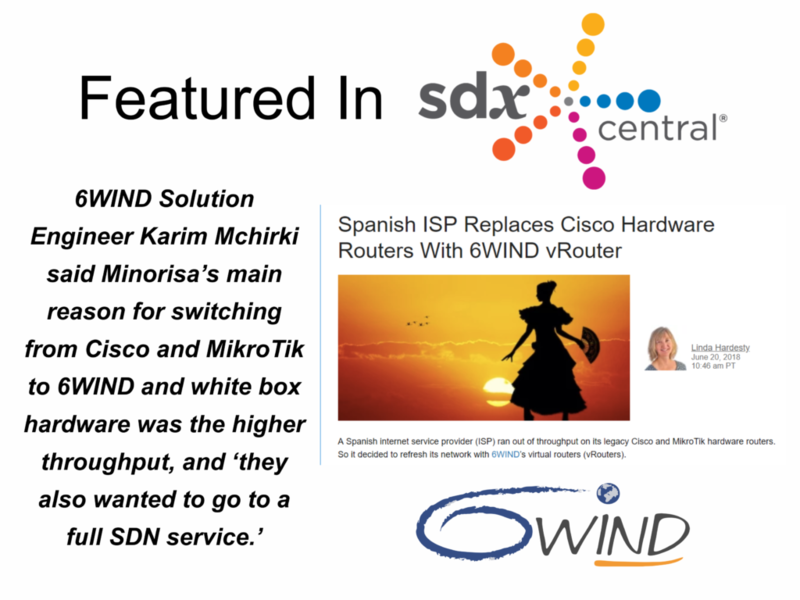 6WIND’s vRouters help Minorisa’s broader architecture transition to white box networking by replacing its legacy Cisco and MikroTik hardware with software to meet design goals while reducing costs. Scalable Performance: Based on DPDK (Data Plane Development Kit), 6WIND’s vRouter delivers performance up to 12 Mpps per core of IP Forwarding, 18 Gbps per core of IPsec, up to 1 million routes and 100,000 IPsec tunnels. Performance scales with the numbers of cores and hardware advancements, allowing Minorisa to move from 40G to 100G without redesigning its network. Compact Infrastructure Design: 6WIND vRouters increase performance on standard 1 and 2 rack unit (RU) servers, reducing overall data center footprint. SDN Ready: 6WIND vRouters include open APIs for integration with third-party and open source Software-defined networking (SDN) managers and orchestrators.